My brain goo’s coming out all artistical, thanks to you. When I was looking to upgrade the window treatments in our living and dining rooms, I naturally turned to the internet for inspiration. 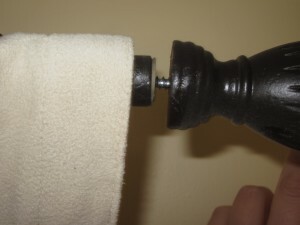 I was lucky to find the perfect tutorial, How to Make a Cheap, Awesome Professional Curtain Rod at House of Hepworths. It really delivers on the title, showing how to make great-looking curtain rods from super-affordable electrical conduit. There’s no improvement to be made on the Hepworths tutorial, but I did change up a few things based on my specific dealio. First, I wanted double rods, so I started with these allen + roth brackets that would work with the conduit. 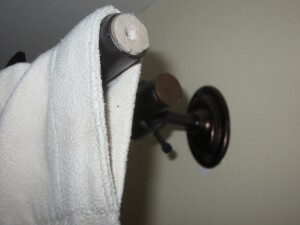 I used Rustoleum “Dark Walnut” spray paint to work with the brackets. The conduit is the same diameter for both rods, but the rod for the sheers is slightly shorter. The HoH rod was finished off with an Ikea finial with a fitting that clamped it to the rod. I went to Ikea, but the shopping gods were not with me — none of the finials in stock spoke to me. (Speaking of speaking, there are minutes of fun to be had interacting with Anna, Ikea’s “automated online assistant” — Siri she ain’t.) Instead, I picked up some screw-in finials at Menard’s and painted them to match the rods. But the conduit is hollow. What could I possibly screw them into? As is weirdly common Chez D’oh, the answer involved wine. I whittled down some of those rubbery pseudo-corks and pounded them into the ends of the conduit. I want you to know: I did try actual corks from actual wine, but real corks did not hold as well as the fake ones. These ideal curtain-finial-holding corks are found on many a bottle of ridiculously sweet riesling featured at Trader Joe’s. Keep the finial straight as you screw it in. The end of the conduit/rod will nestle into a recess on the base of the finial, making the whole thing look like a single, custom rod. On most double rod sets, the second rod is shorter and does not have a finial. I painted into the ends of the second rods so they were not obviously unfinished, but I still wanted them to be closed. On a lark, I checked to see if a penny would be the right size. We’ve had the rods in service for a few months now, and I’m really pleased with them. Since our living and dining rooms are separated only by a big open arch, I needed consistent hardware, and without the HoH insight about conduit, we would have been looking at quite a bit of money. The dining room windows. Hmm, maybe more colorful drapes in future? This solution? About $10 in conduit, $5 of spray paint, $10 for finials, $30 on brackets, $20 in cheap wine, and $0.04 to cover decorative pennies. And we would have bought the wine anyway! 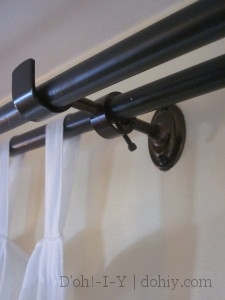 Update: Looking for a way to make cheap wooden curtain rods? We’ve got you covered. 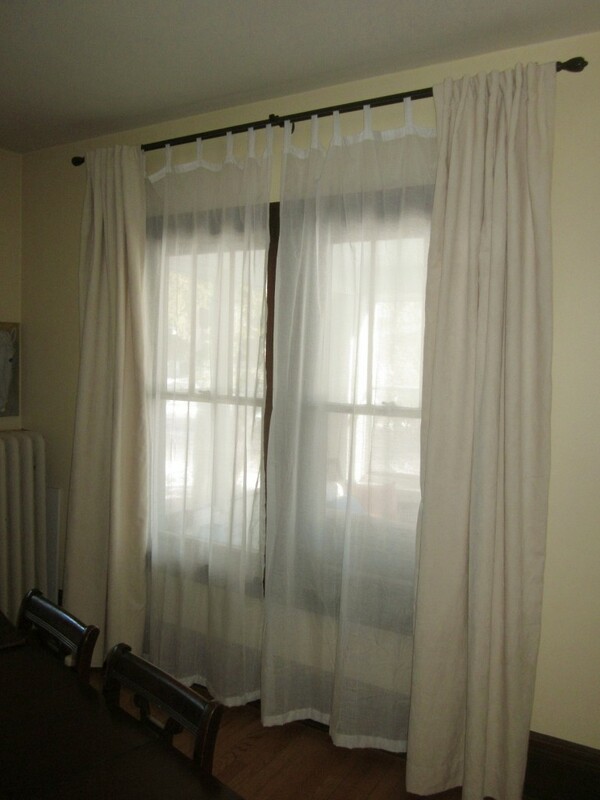 This entry was posted in Decor, Windows & Doors and tagged curtain rod. Bookmark the permalink.